Step Right Up! Try Your Luck! A gathering of the exotic from around Azeroth (and beyond! ), the Darkmoon Faire is a celebration of the wondrous and mysterious. This mist-shrouded island is a conundrum wrapped in an enigma, accessible at the beginning of each month for one week only. Don’t be shy now, don’t be bashful—step right up for a tantalizing glimpse of what Faire founder Silas Darkmoon has in store for you! 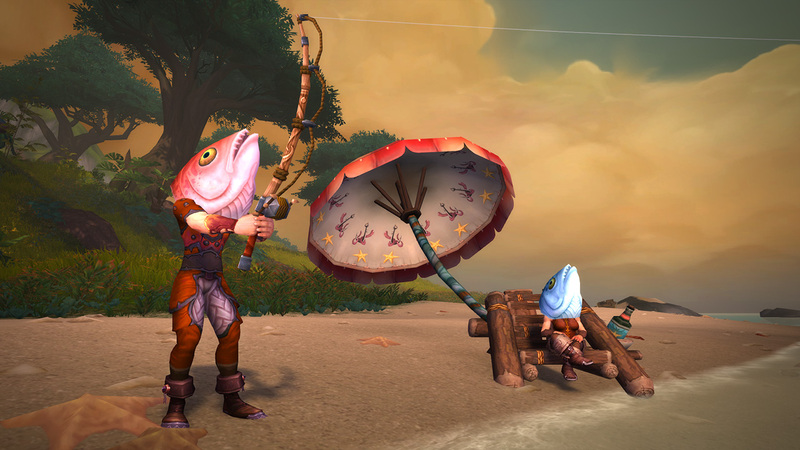 The Darkmoon Faire returns this Sunday, April 7 with a brand-new roller coaster ride, new balloon-themed pets, and the latest haute couture fashion accessories: severed fish heads! 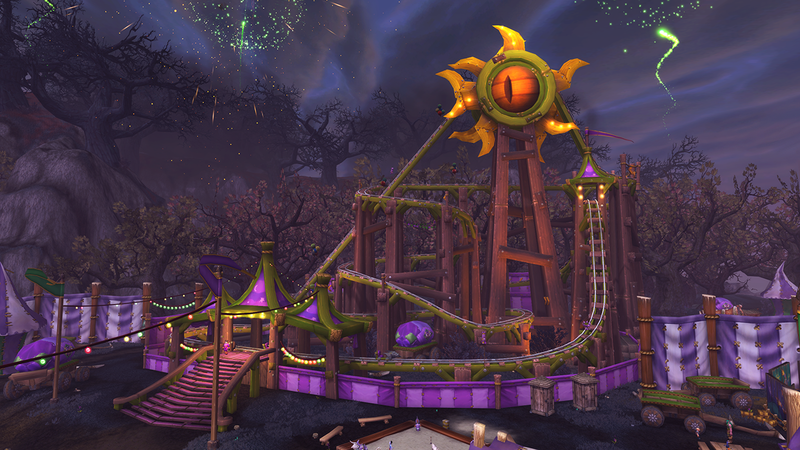 The Darkmoon Faire Roller Coaster is the longest, tallest, and fastest wooden roller coaster in Azeroth! Grip the edge of your seat as you get tossed around swerving through curves and taking terrifying plunges on this rickety track of twisting timber. There's no height requirement, so dwarves, gnomes, and goblins can ride without having to measure up. Brave riders will be granted the WHEE! buff, which increases experience and reputation earned for one hour. The experience gain will lend itself to collecting Heritage Armor sets and for unlocking Allied Races, including the recently released Kul Tiran humans and Zandalari trolls. Darkmoon Prize Tickets burning a hole in your pocket? For 90 tickets, Carl Goodup will sell you three new pets to commemorate your visit—the Horse Balloon, Murloc Balloon, and Wolf Balloon. Just make sure to keep them away from pointy objects. Darkmoon Island offers 360 degrees of seas full of interesting finds. Cast a line and maybe you’ll reel in a Severed Crimsonscale Head or Severed Azurefin Head. Wearing them is all the rage at the faire this season. Starting on the first Sunday of each month, lasting one week. Darkmoon Island, accessible from portals in Elwynn Forest (Alliance) and Mulgore (Horde). You can easily reach the portals located in Elwynn Forest and Mulgore by paying a Darkmoon Faire Mystic Mage (located in Stormwind, Orgrimmar, and Dalaran) to teleport you there. Although there is no level restriction to attend the Faire, you can only travel to the island while the Darkmoon Faire is open. Completing games and quests on Darkmoon Island will generally reward you with Darkmoon Prize Tickets. These are used to purchase most of the items you will find on sale at the Darkmoon Faire. Get ready to shred your vocal chords—Blight Boar plays literal death metal at the Cauldron of Rock every half hour. Rage on stage with the undead band and defeat the Death Metal Knight who tries to upstage their performance. Prove you’re the ultimate superfan during the encounter by defeating the Death Metal Knight and his Ghouls. After successfully defending Blight Boar, players will have a chance to receive a rockin’ prize. Transform into lead singer Devlynn Styx and perform an epic Blight Boar performance. Take the stage with this epic transmogrifiable guitar. The Tauren Chieftains (Samuro, Sig Nicious, Bergrisst, Mai’Kyl, and Chief Thunder-Skins) play near the boardwalk at the Faire. They will be here all week long for your viewing pleasure, so make sure to check it out and /dance to their amazing music. Life is full of mystery and wonder; no two adventurer’s tales are alike. Seek out Azeroth-renowned fortune teller Sayge to discover your future. After answering two of Sayge’s questions, you will receive a buff based on your responses. Can’t handle the Darkmoon Faire Roller Coaster? Never fear, we have a ride that might be more your speed: the Darkmoon Carousel! Choose to ride on a rocket, gryphon, wyvern, dragon, or murloc as you spin around leisurely. After several turns, you will be granted the WHEE! buff which increases your experience and reputation gained for an hour. Come see creatures up close from far and wide in our petting zoo. Captured from the jungles, beaches, and deserts across Azeroth and beyond, these beasts will fill you with awe and wonder. Although be careful to not make eye contact with the basilisk, lest you turn to stone! The dreadful Darkmoon Rabbit and Moonfang are terrorizing the outskirts of the Faire! Brave adventurers are needed to put these menaces down once and for all. Players can earn rare pets and toys by slaying these mythical beasts that roam the mysterious isle. Don’t go it alone! Those woods are lovely, dark, and deep: Use Group Finder to get a little help from your newest friends. This ill-tempered bunny is ready for some fighting action! This cute little wolf must be taken care of by someone valorous, lest he become a monster like Moonfang. This headdress gives you a wild, fearsome appearance. This toy allows the player to transform into Moonfang! Gives the player a quest which rewards them with 10 Darkmoon Prize Tickets. Allows players to mount Moonfang herself for the duration of the Darkmoon Faire. Sail east of the island and dive deep to slay Erinys. Players have a chance to receive the Ring of Promises which starts a quest. Turn in the item to Chester who will reward you with the Ring of Broken Promises toy. Turn into a fel-infused Blood Elf! 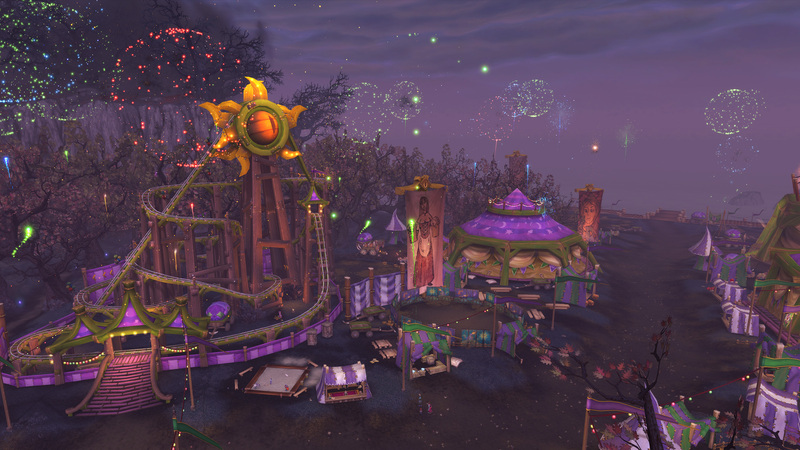 Like any carnival, the Darkmoon Faire boasts plenty of things to do. Taking part in the daily minigames will reward you with Darkmoon Prize Tickets, a healthy amount of Darkmoon Faire reputation, and perhaps few other surprises! All you need is a Game Token to participate in any of these six games which are sure to test your skills, coordination, and reaction time. Are you a skilled crafter? The Darkmoon Faire needs your help to keep its activities going! Use your skills to keep the Faire a fun place for everyone, and you will get more than just gratitude from it. Helping the Faire gives you insight regarding your own skills, making you a better crafter in the long run. It doesn’t hurt that you also get Game Tokens and Darkmoon Prize Tickets for your troubles! Upon reaching the Faire, you can acquire a Darkmoon Adventurer’s Guide. This guide will allow you to collect Darkmoon Artifacts such as the Captured Insignia or a Mysterious Grimoire while doing activities such as questing, dungeons, raids, or PvP out in the world. Turn in those artifacts at the Faire for fabulous prizes! The fun at Darkmoon Faire extends to all of Azeroth’s planes! Collect 250 Grisly Trophies by killing creatures that offer experience and Honor with your handy Darkmoon Adventurer’s Guide. Soar through the star-studded sky and collect at least 15 rings to win a Darkmoon Game Prize while flying. If you collect 50 rings, you’ll receive the toy Blazing Wings, which will give your character the appearance of having fiery wings for an hour! Completing the achievement Brood of Alysrazor will grant you the toy Blazing Wings. It’s hammer time! But don’t lash out at everything in sight, because the gnolls come in three types: normal, Hogger, and baby. Whack a normal gnoll for one point and a Hogger gnoll for three points, but if you hit a poor defenseless baby, you’ll be knocked down for a few moments. You only have 60 seconds to earn 30 points! Completing the achievement That’s Whack! will grant you the pet Hogs. The Blastenheimer 5000 Ultra Cannon launches Fairegoers through the air towards a target sitting in the waters near the boardwalk south of the fairground. Getting a bullseye earns five points; landing very close to it earns three points; and getting near earns one. You need to accumulate just five points to complete the quest! Test your skills in the shooting gallery! You have just 60 seconds to earn 25 points by shooting targets as they light up. Quick shots earn twice as many points as a normal shot, so choose your strategy: high-speed blasting or careful accuracy? You have a bunch of rings. There is a spike on a turtle. Can you guess where this is going? With just three successful throws as your goal, from a maximum of 10 attempts, how hard can it be? Completing the achievement Triumphant Turtle Tossing will grant you the toy Darkmoon Ring-Finger. Use your Darkmoon Tonk to destroy 30 Tonk Targets in 60 seconds to win a Darkmoon Game Prize and 45 Tonk Targets to score a Darkmoon Tonk Controller toy. Beware of the enemy tonks and mini-zeppelins! Completing the achievement Ace Tonk Commander will grant you the toy Darkmoon Faire Tonk Controller. Master pet tamer Jeremy Feasel is waiting for you and your battle pets! You can challenge him for the fee of one Darkmoon Game Token, and maybe find a Darkmoon Eye in your Darkmoon Pet Supplies if luck is with you! Head down to the boardwalk and race all over the countryside around the Darkmoon Faire. Avoid the course’s obstacles using speed boosts, springboards, and other tools and tricks to finish the race as fast as you can. Only the fastest racers will qualify for the achievements and fabulous rewards that come with them. Complete the races on four racer mounts—Powermonger, Wanderluster, Rocketeer, and Racing Strider—for the rewards listed below! You can redeem your hard-earned Darkmoon Prize Tickets for all sorts of rewards! The Darkmoon Faire offers a myriad of interesting items, transmog sets, pets, and mounts. Ride in style with four mounts that you can unlock during the Darkmoon Faire. All prizes can be purchased with Darkmoon Prize Tickets. Darkmoon Dancing Bear: A lot of people like bears. Even more of those like dancing bears. For the low, low price of 180 Darkmoon Prize Tickets, you too can forever own a rideable dancing bear. What else could you ask for? Swift Forest Strider: Vibrant purple plumage adorns this gorgeous breed that can only be found in the forests of Darkmoon Isle. It’s all too willing to give you a lift on your adventures and explore off the shores of the only home its ever known for 180 Darkmoon Prize Tickets. Darkwater Skate: Calling all fishers! Prove your prowess (or patience) by fishing up the big fish—more than just a story. Found only in the dark waters surrounding Darkmoon Island, this skate lets you dive into the waters of Azeroth and beyond. 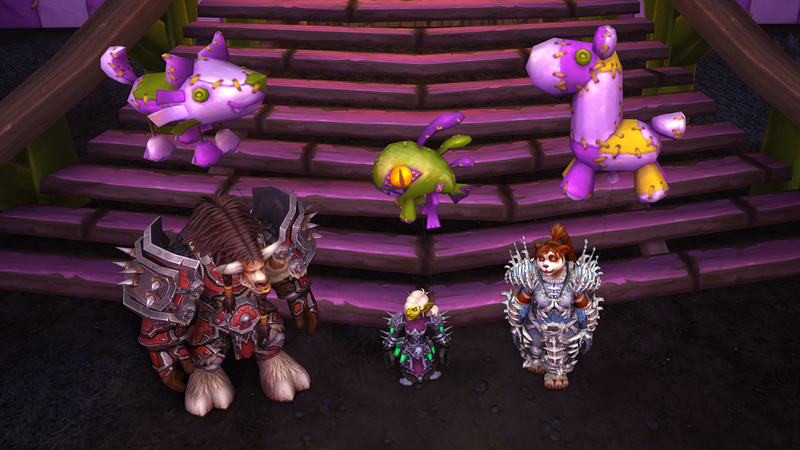 Several pets are available at the Darkmoon Faire from Lhara for 90 Darkmoon Prize Tickets each. They can also sometimes be found inside Darkmoon Game Prize boxes. Cash in your bundles of tickets on balloon pets to accompany you on your adventures! These delightful creature-inspired balloons are sold by balloon vendor Carl Goodup. Several cosmetic items are available to be redeemed with Darkmoon Prize Tickets. Baruma offers complete replicas of classic dungeon sets. These replicas have no combat statistics, but can be used for transmogrification purposes. They can be redeemed for Darkmoon Prize Tickets (individual redemption values vary). Gelvas Grimegate exchanges fun toys and carnival items for Darkmoon Prize Tickets. Take a little bit of the Faire with you wherever you go! The Darkmoon Faire boasts a variety of quests to boost your characters’ professions in increments of 5. Several Legion Inscription recipes are sold by Professor Thaddeus Paleo: Technique: Darkmoon Card of the Legion (Rank 2) (50 tickets) and Technique: Prophecy Tarot (Rank 2) for 5 tickets and for Technique: Prophecy Tarot (Rank 3) for 35 tickets. Legion also brought a new set of Darkmoon Cards, which are item level 835 and can be upgraded to ilvl 875 via Obliterum. These are crafted by scribes and can be created any time of the year after purchasing the recipes at the Darkmoon Faire. Wear this dapper piece to increase experience and reputation gains by 10% for 1 hour. Hat is consumed on use. Ever wonder how Darkmoon Island is surrounded by perpetual darkness? The magic is captured in Inky Black Potion that can be used anywhere to create a similar nighttime effect. This 16-slot bag is perfect for carrying your Darkmoon Isle swag home! From the moment you step into the Faire you can earn achievements. Push yourself to score big and you’ll snag rewards for your efforts. Fly through 50 Blazing Rings in one flight session of Firebird’s Challenge. Complete “The Real Race” with a Racing Strider within 11 tolls. Complete The Real Big Race with a Racing Strider within 20 tolls. Complete The Real Race with a Rocketeer within 11 tolls. Complete The Real Big Race with a Rocketeer within 20 tolls. Complete The Real Race with a Wanderluster within 11 tolls. Complete The Real Big Race with a Wanderluster within 20 tolls. Complete The Real Race with a Powermonger within 11 tolls. Complete The Real Big Race with a Powermonger within 20 tolls. Feeling lucky? How long can you last against impossible odds? Do you have what it takes to best all comers and take the pit fighter’s prize? Start at midnight and then every three hours, on the hour, you will have a chance to compete for the prize. But if wanton destruction is all you care about, the pit is always open. If you win, you can start the Master Pit Fighter quest, which will grant the Returning Champion Heirloom trinket. Challenge the Pet Battle Masters of the Darkmoon Faire. If you best them, you have a chance to earn the Darkmoon Eye and Syd the Squid! Step right up! The next Darkmoon Faire runs April 7–April 13, and will return next month on May 5. Now go out there and win some prizes!